Recall last week friends I reported that the fishing had improved after an unusually slow start. Well this week it moved up a few more notches as chinook and coho salmon have been abundant in most the usual places. D.J. 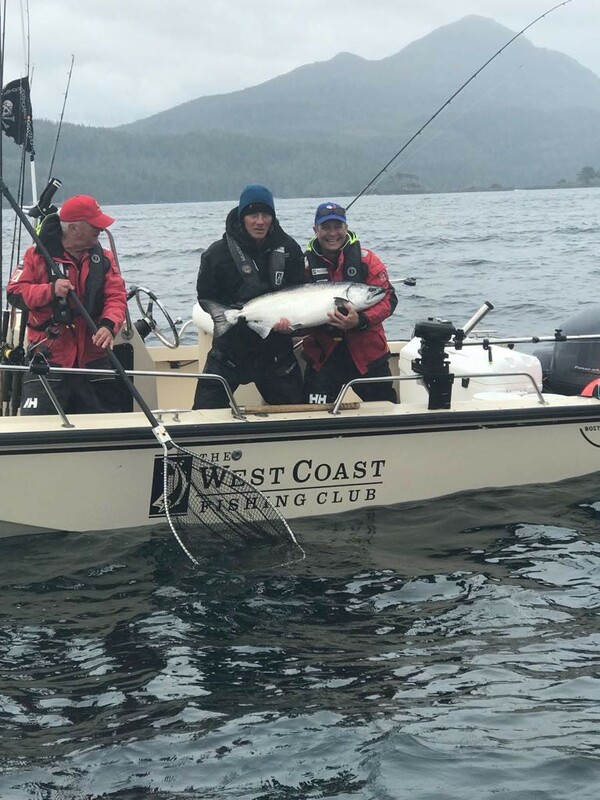 Shinduke, head guide at North Island Lodge reported that Cohoe Point and Andrews Point have yielded a mixture of smaller chinook and coho with the odd tyee and high-twenties models mixed in. 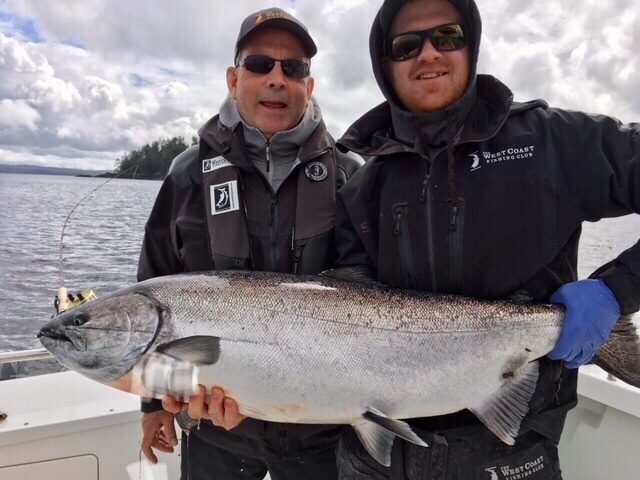 Guest David Rubin picked up a 31-pound tyee off Cohoe with guide Graham. Glenn Held did exactly the same thing on a self-guided mission. Glen has reportedly been in search of a tyee for a few years now, so was naturally pretty pumped about it. 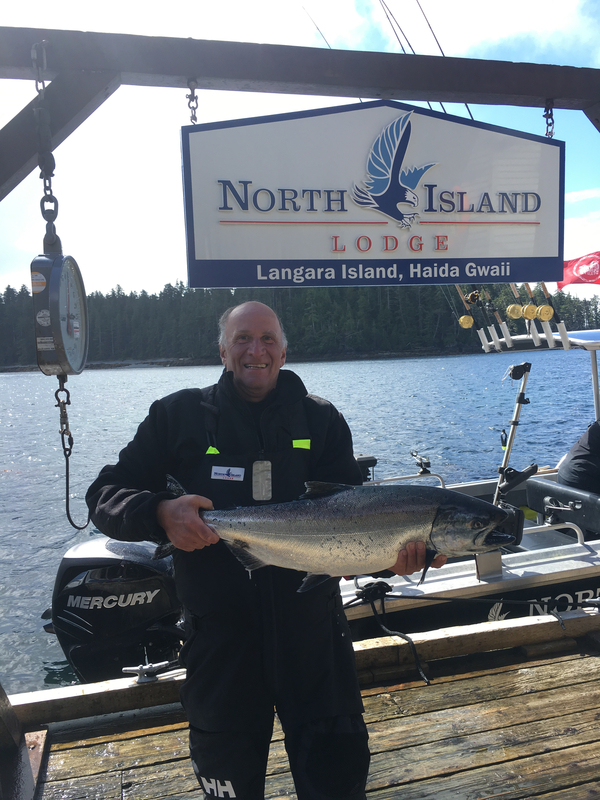 North Island Lodge guest, Glenn Held with a 31 lb tyee. David Rubin with a nice 31 lb tyee. 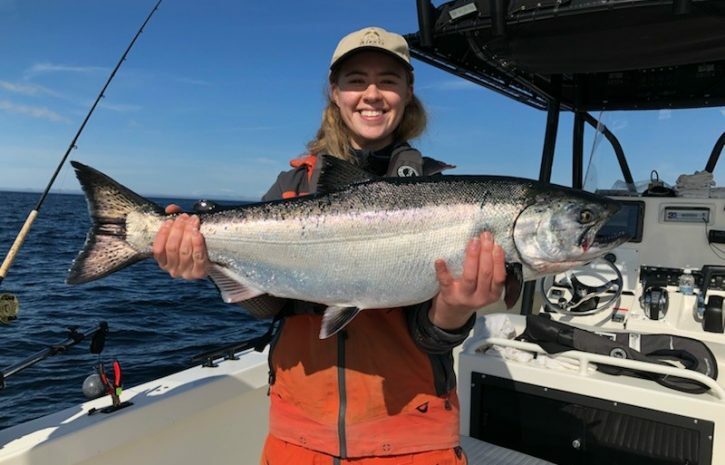 D.J.’s crew has been finding both coho and chinook salmon doing drifts off-shore of Pillar Rock towards the Jalun River. For those with a bit of patience, the Fishbowl, Chanel Reef and Bruin Bay have produced some decent sized fish on the right tide. 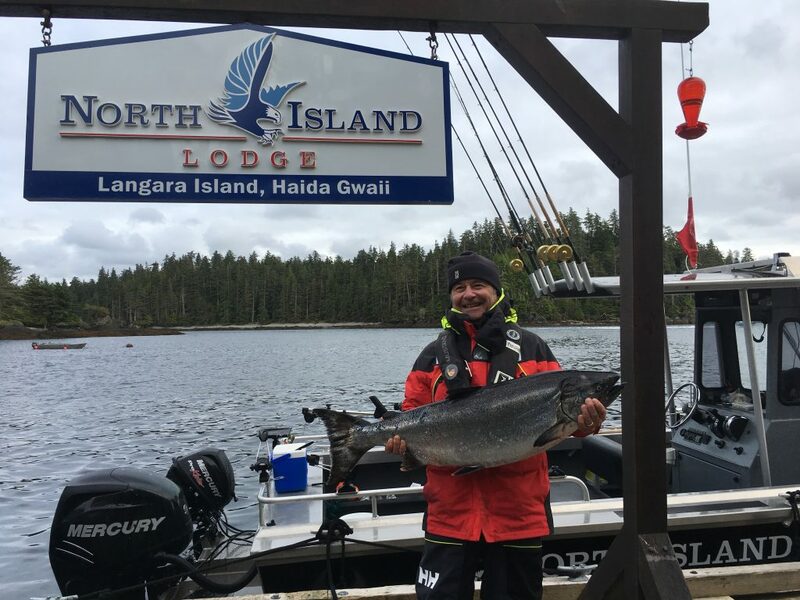 North Island Lodge was home for the past week for Richard and Christina Masef, who came all the way up from Florida to do back-to-back unguided trips. 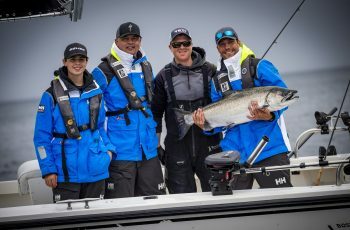 Pretty savvy anglers, according to lodge manager Todd McIntyre, who says they helped themselves to a good number of chinook up to 20 pounds and coho as big as 12. Todd pulled a guide shift himself one morning and found 10 chinook and five coho for guest Elon Hernandez, not bad for a morning’s work. They also got their full treatment of marine wildlife, including the Pacific white-sided dolphins that have made appearances of late. 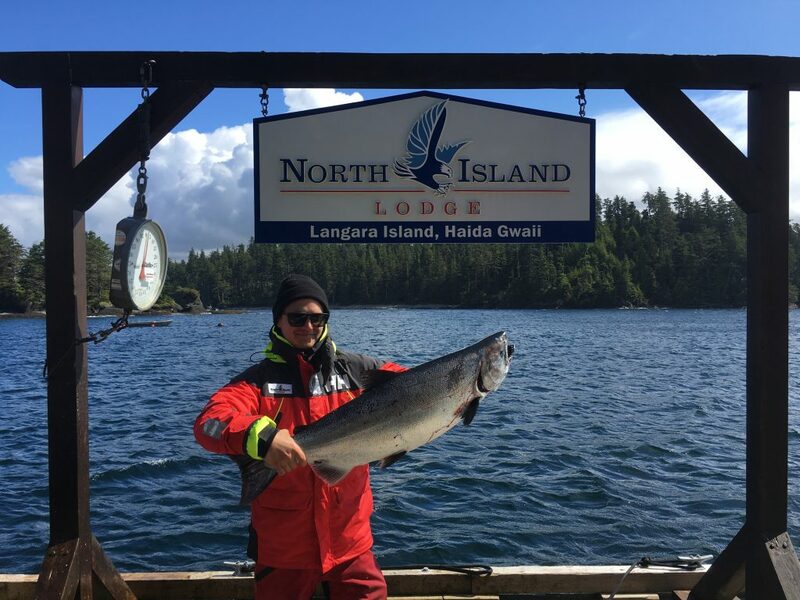 Longtime guest, Richard Masef enjoying his back-to-back trips at North Island Lodge. If you read Screamer’s last two reports from The Clubhouse, you already know that it’s been a similar story for the gang at The Clubhouse. Read the latest here. The guides are now finding more bait and more fish, with a slow but apparently steady increase in size, although nothing so far to top a released 43 reported late last week down at The Outpost for Matthew Follwell. 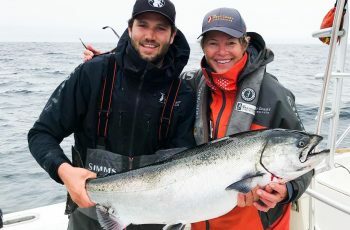 Matthew Follwell with the season’s top fish at The Outpost – a 43 lb released tyee. The top fish from The Clubhouse this week went to Gary Hayden, a 36 caught and released with the help of guide Korey, out at Andrews Point. 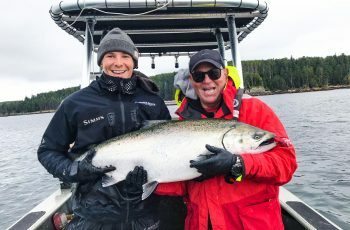 The following trip Reg Pattemore executed a perfect 33-pound catch and release off Lacey Rock with help from Screamer. 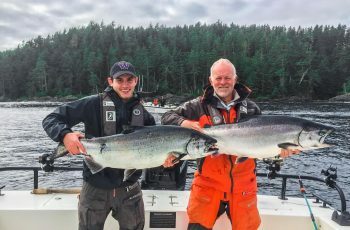 Reg is a regular guest with son Liam and they reportedly got into a lot of fish, including some double headers, which is what we hope to see a lot more of as the action heats up. Charles Burke was the most recent angler to earn a coveted WCFC tyee pin with a 30-pound fish somewhere on the east side. Brennan Helmers meanwhile was among several anglers to boat fish in the high 20’s with a 28. 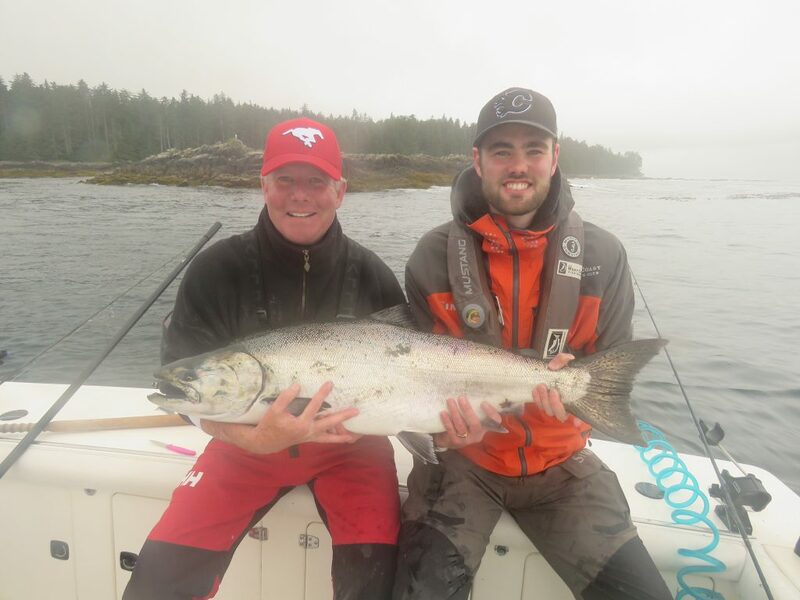 Longtime guest Gary Hayden and guide Korey with a beautiful 36 lb released tyee. Father-son duo, Reg & Liam Pattemore with Reg’s 33 lb catch and release. Double header for the father-son team. Fish on! 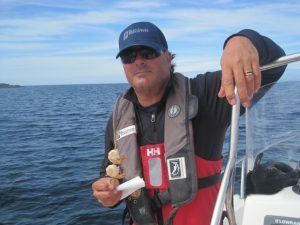 Guests at The Outpost also saw some much improved fishing in and around the waters of Port Louis. 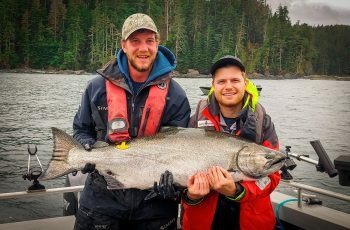 Same story as further north with more and more chinook salmon in the low to mid-twenties. Steve Merritt registered the prize hog this past week with a 33.5 pound catch and release. Nice work Steve; it is really encouraging to see how anglers at The Club are increasingly happy to snap a quick pick and let these larger fish resume their natal journeys. 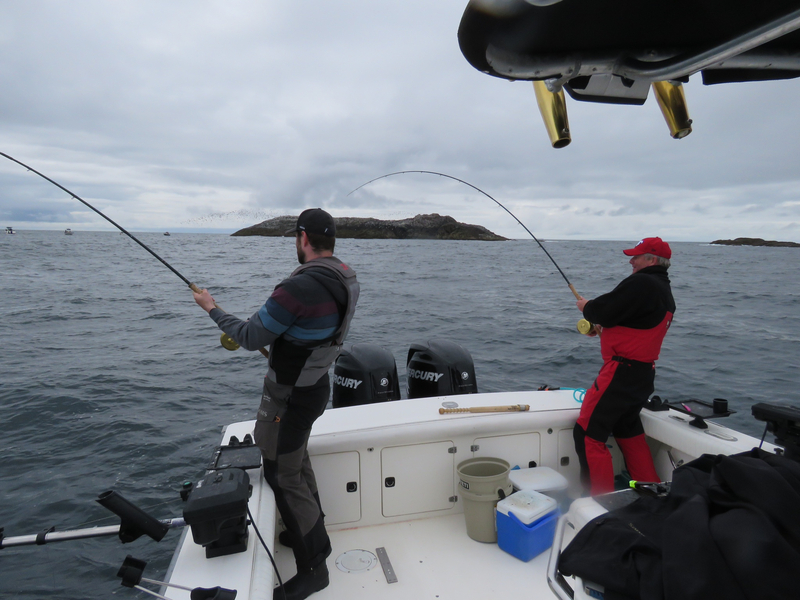 Fishing for halibut on the troll is still working well for anglers at The Outpost and at Langara Island. That’s it for now friends. I hope you are now enjoying these full-on days of summer and that you venture soon to the waters of mystical Haida Gwaii. Until next week, please stay safe and well. D. J. Glad to see you are still at West Coast Fishing Club. Frank & I had some of the best King Salmon fishing with you !! Fishing slow here in Sitka but I did manage to catch a 53 lb. king last week ! All the best my friend.